What is Rhinolast used for? How do I use Rhinolast? Rhinolast nasal spray alleviates nasal symptoms resulting from an allergic reaction like hay fever or hypersensitivity to dust mites, fungi or pets. The body reacts to those irritants by generating histamine. It makes the nose mucosa thicker and irritates it which creates symptoms like sneezing, itchy nostrils, a runny nose and/or a blocked nose. Rhinolast blocks the effect of histamine and thus prevents or alleviates the nasal symptoms. 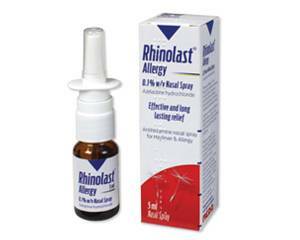 Rhinolast nasal spray must only be used for allergic symptoms. Do not use this drug to fight the symptoms of a cold. Before you apply Rhinolast nasal spray for the first time you need to press the atomiser a few times until a mist appears. The bottle is then ready for use. Blow your nose before using Rhinolast. Hold your head upright while applying the nasal spray and inhale the fluid as well as possible More information about the application of the nasal spray can be found in the patients' leaflet. Rhinolast nasal spray can be stored for 6 months after the first application. Rhinolast nasal spray contains 140 microgram azelastine per pulverisation. Ask the doctor how often and how long you must use this drug. The general directives for dosage are for adults and children of 5 years and over: 1 pulverisation every morning and evening in each nostril. If you forget a dose you can catch up, unless it is almost time for the next dose. Consult the patients' leaflet for a complete list of possible counter indications, warnings and other side effects. It is not known whether Rhinolast is a risk to the health of an (unborn) baby. Do not use this drug if you are or are trying to get pregnant, or if you are breastfeeding unless your doctor advises otherwise.